Garuda Indonesia is again planning double digit capacity growth in 2015 as the group expands its fleet by 23 aircraft. But the pace of growth – approximately 10% to 15% – represents a slowdown compared to 2014 or 2013. Garuda’s international network will likely expand by one destination, Nagoya, as the focus will primarily be domestic, particularly its regional operation. Expansion to Europe is not expected as Garuda plans to use the three additional 777-300ERs it is slated to add in 2015 on existing routes to Saudi Arabia. While 2015 will not be a momentous year from a growth or strategic standpoint it will mark the start of a new era for Garuda due to the first leadership change in a decade. The new CEO will face familiar challenges including intensifying competition and further devaluation of the local currency, which could offset the impact of lower fuel prices. Garuda on 12-Dec-2014 appointed Arif Wibowo as president director, replacing Emirsyah Satar. Mr Satar was one of the longest standing airline CEOs in Asia, having joined Garuda in Mar-2005, when the airline was on the brink of bankruptcy. Under Mr Satar’s leadership, Garuda completed a successful restructuring, leading to a period of rapid and generally profitable growth in what has been a fast evolving and competitive market. Garuda posted annual net profits every year from 2007 through 2013. Other major accomplishments during Mr Satar’s tenure included an initial public offering in 2011 and entering the SkyTeam alliance in Mar-2014. Mr Satar resigned on 8-Dec-2014, vacating his post three months prior to the conclusion of his second five-year term. The resignation was expected as government regulations precluded another term and Mr Satar had indicated multiple times that he intended to hand over the reins by the end of 2014. Mr Satar’s accomplishments were recognised by CAPA in Oct-2014, when he received CAPA’s Asia-Pacific Executive of the Year award. Mr Wibowo has worked for Garuda for over two decades and has been CEO of Citilink since 2012, when the LCC became a Garuda subsidiary and secured its own operators’ certificate. Citilink, which was previously a unit of Garuda and operated under the GA code, has expanded rapidly under Mr Wibowo. Citilink posted in 3Q2014 its first profit since the airline became a subsidiary and began reporting separate financial figures. In the first two years as a subsidiary (3Q2012 through 2Q2014) Citilink incurred net losses of about USD100 million. But Citilink’s financial performance began improving in 1H2014, when it incurred a net loss of only USD16 million. In 3Q2014 it turned the corner with a net profit of USD4 million. Over the first nine months of 2014 Citilink generated USD288 million in revenues and flew 5.3 million passengers. The revenue figure represents 45% growth compared to 9M2013 while the passenger figure represents 39% growth. Citilink’s load factor improved by 4.9ppts in 9M2014 to 78.8% as RPKs increased by 36%, outpacing a 28% increase in ASKs. Citilink was able to improve its yield on a US Dollar basis by 5% compared to 9M2013 despite the rapid depreciation of the Indonesian Rupiah. On an Indonesian Rupiah basis Citilink’s yield improved by 22%, an impressive accomplishment given that the carrier only operates domestic services. Citilink’s financial improvement has come despite difficult market conditions which have driven a reduction in profitability at virtually all other Indonesian carriers including Garuda mainline. The Garuda Group overall accumulated pre-tax net losses of USD299 million through the first nine months of 2014 and operating losses of USD250. This compared to a group operating profit of USD29 million and a pre-tax net loss of USD3 million in 9M2013. Garuda is expected to end 2014 with its first annual loss since 2006. But as CAPA previously analysed, Garuda’s financial position has improved in 2H2014 compared to a dismal 1H2014. Garuda’s operating loss was a relatively manageable USD16 million in 3Q2014. In Aug-2014 and Sep-2014 Garuda was again in the black. Market conditions however are expected to remain relatively challenging in 2015. Mr Wibowo reportedly stated after the 12-Dec-2014 extraordinary shareholders meetings which approved his appointment that he expected the airline to again face strong headwinds despite the recent drop in fuel prices. Mr Arif anticipates competition will become even fiercer while the Rupiah will depreciate further. The Rupiah depreciated by about 30% over the last 18 months, impacting the profitability of all Indonesian carriers as most costs are fixed in US dollars. Garuda stated during its 3Q2014 results briefing that about 55% of Garuda’s revenues are generated in Rupiah while 70% of its costs are in US Dollars. Fares in Indonesia have inched up in recent months but the increases have generally not been able to offset the higher costs. There was also a lag of several months between the depreciation, which mostly took place in 2H2013, and the rise in fares. The depreciation of the Rupiah also has impacted demand and consumer sentiment as the spending power of Indonesia’s expanding middle class has been diminished. Economic growth in Indonesia also has slowed down. Indonesia’s GDP is projected to grow by about 5% in 2014 compared to 6% in 2013 and 2012. Mr Wibowo said he will look to reduce costs to put Garuda on a sounder financial footing. He also reportedly will consider reconfiguring aircraft to include more economy seats – a move which would reduce unit costs while boosting revenues. Mr Satar also had a focus on reducing costs through productivity improvements and fleet renewal. During Garuda’s 3Q2014 results briefing on 14-Nov-2014 Mr Satar again emphasized the need to cut costs further while maintaining safety and service standards. But Mr Satar stressed that Garuda needs to continue expanding in 2015 because if it does not expand other airlines will. Garuda has had a challenging 2014 financially but determined that strategically it needed to continue growing, particularly in the domestic market. The group has been able to grow its share of the domestic market from an estimated 27.9% in the first eight months of 2013 to 29.4% in the first eight months of 2014. Garuda mainline domestic passenger numbers are on track to grow by about 10% in 2014 while Citilink traffic is on track to grow by over 40% on a much smaller base. Meanwhile the overall domestic market will only see single digit passenger growth in 2014, driven partially by consolidation. Garuda’s share of the international market however decreased from an estimated 24.6% in the first eight months of 2013 to 22.8% in the first eight months of 2014. This is mainly driven by aggressive expansion by foreign carriers, which currently account for almost two-thirds of international seat capacity in Indonesia. Garuda accelerated international expansion in 2H2013 and 1H2014 but it struggled to fill the additional seats, resulting in a sharp decline in load factors. In 1H2014 international ASKs increased by 15% but RPKs dropped by 3% as load factor plummeted by 11.4ppts to only 63.5%. In recent months international ASK growth has slowed significantly, resulting in an improvement in international load factors. Garuda wisely deferred plans for launching services to Manila and Mumbai. It did go ahead and launch its other planned new international destination for 2014, London, but scrapped the original plan for non-stops to London and instead is serving Gatwick as a tag to its Amsterdam service. Garuda also scrapped consideration for adding services to France, Germany and Italy. Taipei was also dropped and replaced with a new codeshare with SkyTeam partner China Airlines. Garuda is now focusing on relying more on SkyTeam members and other partners to provide a global network. It also recently implemented an expanded codeshare partnership with Saudia and forged new codeshares with Bangkok Airways and Myanmar Airways International (MAI). International ASKs however will still be up about 10% for the full year in 2014 and are projected to continue increasing in 2015. But the focus will be on expanding in existing markets which have been profitable. For example Garuda plans to continue expanding in Japan, where it has grown seat capacity by about 50% over the last two years, by launching service to Nagoya in Mar-2015. 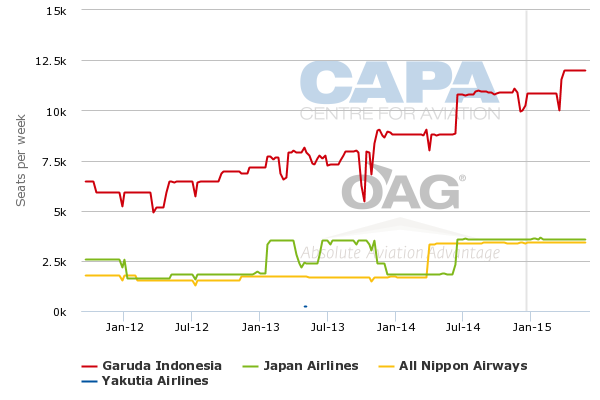 Garuda now accounts for about 60% of seat capacity in the Indonesia-Japan market. Its new partner, All Nippon Airways, accounts for another 20%. Garuda also plans to expand capacity to Saudi Arabia in 2015 through a combination of more scheduled flights and charters. In addition it is planning to launch charter services in 1H2015 to six secondary cities in China. Charters represent a low risk and sensible option for international expansion. Mr Satar told analysts at the 14-Nov-2014 results briefing that Garuda overall plans to increase ASKs by 10% to 15% in 2015 as the group’s fleet expands by 23 aircraft (this is a net figure factoring in deliveries and returns). This includes 18 additional aircraft at Garuda mainline and five additional aircraft at Citilink. Mr Satar told CAPA during the 18-Nov-2014 Association of Asia Pacific Airlines (AAPA) Assembly of Presidents that Garuda’s widebody fleet will grow by five aircraft in 2015 as two A330s and three 777-300ERs are added to the fleet. Garuda currently operates 22 A330s and six 777-300ERs. The 777-300ER fleet was initially acquired to pursue expansion in Europe but has mainly been used in other markets including Japan as Garuda has stepped back from earlier ambitions to operate several non-stop routes to Europe. Garuda is no longer planning to use the three 777-300ERs being added in 2015 to launch new long-haul routes. The aircraft instead will be used on flights to Saudi Arabia. Garuda currently operates 12 weekly scheduled flights to Jeddah. These flights are supplemented with regular charters most of the year to cover the Umrah and Hajj religious pilgrimages. Garuda now uses a mix of 777-300ERs, 747-400s and A330s on its Saudi Arabia flights, according to OAG data. The airline plans to phase out its 747-400s in 2015 and also increase frequencies to Saudi Arabia, both of which will provide opportunities for the 777-300ER fleet. Mr Satar told CAPA the additional 777-300ERs being delivered in 2015 will take over for the 747-400s and be used for additional frequencies in the Saudi Arabia market. The 777-300ER is not the ideal aircraft for the Saudi Arabian market as it features a three-class cabin including first class and a lie-flat business product. But it has become a sensible option given the current market conditions. Garuda has wisely recognised that operating multiple flights to Europe is not financially viable and it is better off focusing on Amsterdam and using SkyTeam partners to cover the rest of continental Europe. Most of the fleet growth at Garuda mainline in 2015 will consist of additional ATR 72 turboprops. Garuda began operating turboprops in late 2013 and currently eight ATR 72-600s with another 17 on order, according to the CAPA Fleet Database. Garuda has been using the ATR 72 to add several new domestic destinations that were previously only served by competitors including Lion Group regional subsidiary Wings Air. More new destinations are planned in 2015 as Garuda continues to open new turboprop bases. Garuda plans to have five ATR 72 bases by the end of 2015 – Bali, Balikpapan, Makassar, Medan and Surabaya. Garuda also continues to add capacity on domestic trunk routes, partially through up-gauging certain flights from 737-800s to A330s. Garuda is committed to further strengthening its domestic presence through a combination of capacity increases in existing markets and extending its reach to more secondary markets as it takes more ATR 72s. The group also continues to expand at the bottom end of the price market through its Citilink subsidiary. Citilink now operates alongside Garuda on most trunk routes. Citilink plans to add five A320s in 2015, giving it a fleet of 37 aircraft. As CAPA has previously outlined, Citilink expects to resume international services in 2015 but will primarily focus expansion on the domestic market, where it sees ample opportunities for further expansion. Garuda enters 2015 rather cautiously and will need to be prepared to make adjustments if market conditions dictate. But the planned 10% to 15% capacity is likely sustainable, particularly if the pace of economic growth picks up. Garuda has expanded ASKs at a double digit rate for seven consecutive years, including by 20% in 2013 and approximately 16% in 2014. Competitors, particularly Lion, have grown at similar and at times faster clips. It was inevitable the rate of growth would slow. But there are still plenty of opportunities in Indonesia for further expansion and strategically Garuda cannot afford to slow down too much if it is to hold its own for the longer term. Market share battles can be destructive of short term profitability but, in such a dynamic growth market as Indonesia, failure to keep one eye on the longer term can threaten essential viability.